We can't cram any more processing power into silicon-based computer chips. 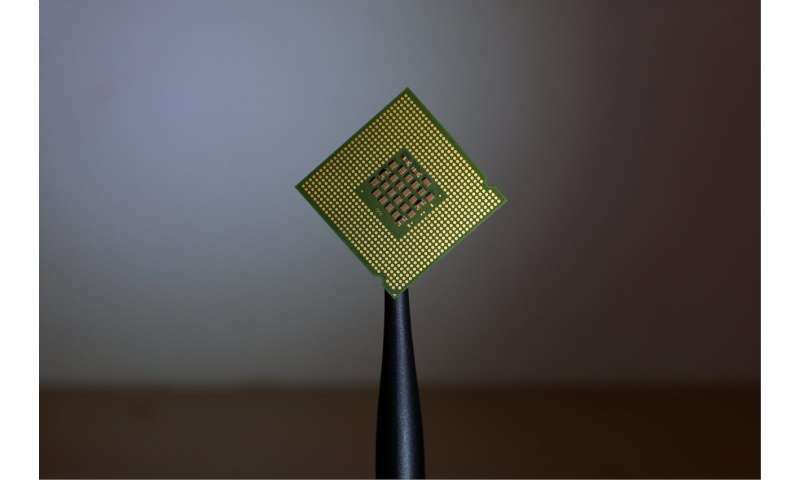 But a paper published in Nature overnight reveals how we can make electronic devices 10 times smaller, and use molecules to build electronic circuits instead. We're reaching the limits of what we can do with conventional silicon semiconductors. In order for electronic components to continue getting smaller we need a new approach. But until now, scientists haven't been able to make a stable device platform for these molecules to sit inside which could reliably connect with the molecules, exploit their ability to respond to a current, and be easily mass-produced. An international team of researchers, including Macquarie University's Associate Professor Koushik Venkatesan, have developed a proof of concept device which they say addresses all these issues. "Imagine a miniaturised transistor made up of several single molecules," says Koushik. "That's the promise of molecular electronics—devices that are smaller, faster, have more memory and are cheaper to make." "Molecular electronics hasn't previously lived up to expectations, but we've seen a renaissance of the field in the last five to six years," he says. "The device platform is the missing link. We hope work like ours will accelerate this type of technology. "The electronic buildings blocks of the future will be molecules." "This fundamental research is extremely exciting as it points the way to practically 'wiring molecules' by exploiting the fact that Koushik and his colleagues have made a metallic nanoparticle provide a reliable electrical contact to individual molecules," says Professor Alison Rodger, Head of the Department of Molecular Sciences at Macquarie University. "As a molecular scientist it illustrates to me the importance of understanding the design and function of molecules for the future realisation of a molecular electronics technology. "It is amazing to think that this work leads the way to true molecular-sized electronic circuits."